When last we looked in on our hometown hockey heroes in "Pucks of Our Lives," they had just beaten division rival Uintah on Wednesday, Feb. 19, in the third round of the Utah high school hockey state championships. The Record press deadline then forced us to say "Stay tuned" in a big radio-soap-opera-announcer voice, as we couldn’t detail what happened in Friday night’s game against Viewmont. A berth in the state championship game was on the line. For the Cliff Notes version, the Miners lost, and then won, and then won again, forcing a second "if necessary" game. Well, yes Virginia, it is necessary now. Park City plays Viewmont Friday night at 7 p.m. at the Salt Lake Sports Complex in a single game for the state hockey championship. OK, let’s rewind and check those games out. 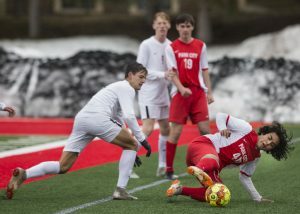 Suffice it to say, Park City played its worst game of the season against Viewmont Friday night, Feb. 21. The Miners made numerous puck possession errors, gave up a 2-0 lead, moved back ahead 3-2 with 1:35 left in regulation, allowed the tying goal with 30 seconds later, and then lost with 10 seconds remaining in overtime. 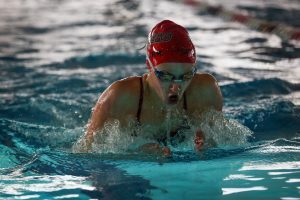 But that episode quickly became old news because the Miners had to come right back Saturday night, Feb. 22, now denizens of the losers’ bracket, and face the same Uintah Utes they had beaten just three days previously. Park City had a hangover from the disappointing Viewmont loss and came out flatter than the Pillsbury Doughboy with a bad batch of yeast, allowing two Uintah goals for a 2-0 first period lead. 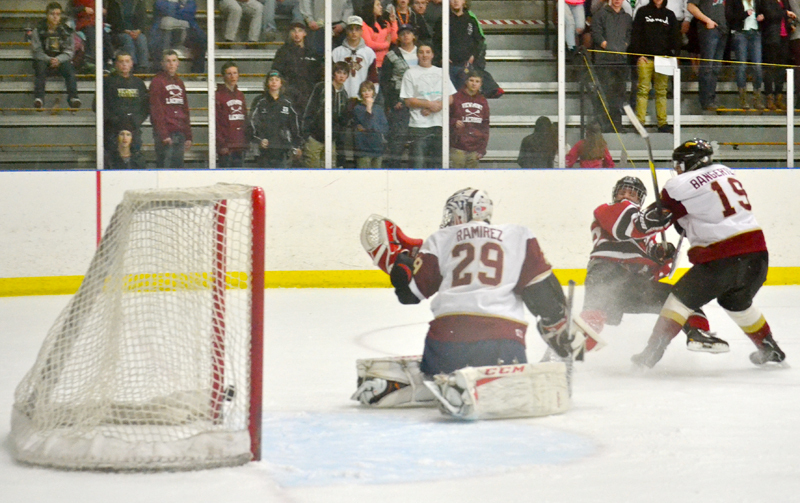 It stayed that way through the second period, although Park City tightened up its play. Then, in the third period, an assist came from an interesting source. Senior defenseman David Jenkins, injured and out since mid-December from an accidental knee-on-knee hit in an intrasquad JV game, wasn’t happy with what he was seeing from his team. 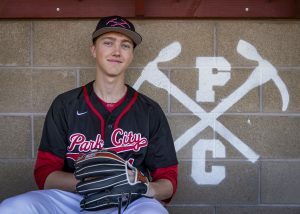 He stood up behind the Park City bench at the Salt Lake Sports Complex and started berating his teammates for their play. Paraphrasing, he asked how in the heck he was going to get to come back and play in the national championships if his teammates didn’t pick it up. Junior wing Will Radovan’s scorching wrist shot, off of a behind-the-net pass from sophomore linemate Will Miele, broke the ice with 11:28 left in the third period. And the Utes started making mistakes as the Miners pressured them mercilessly. With just 3:38 left, senior wing Noah Pranschke scooped up a deflected faceoff win from senior center Carson Walker, moved right and rocketed a wrister that beat the Uintah goalie over the back shoulder to knot the score at 2-2. Just 26 seconds later, hard work on the wall paid off. Senior center Harry Hanskat and Radovan attacked the two Uintah defenders on the end wall in the Ute zone. The puck moved along the end boards as both players took turns squeezing the Ute defenders. Then, in the right corner, the puck squirted out to an opportunistic Miele in the slot. He was already loaded and launched a slapshot into the upper left corner of the net for the game winner at 3:12: 3-2 Park City. Fast forward through the Thigh Master infomercial to Monday night’s rematch with Viewmont in the potential state championship game at the Salt Lake Sports Complex. Viewmont, without a loss in the double-elimination tournament at this point, would have taken the trophy with a win. But Park City had much to prove after the team’s error-filled loss three nights previously and the team came out with an aggressive mindset. The Miners were not to be denied this night, though. Mistakes that came from indecision in the prior Viewmont game were non-existent. Park City players beat the Vikings to loose pucks, made better passes and played as a team. 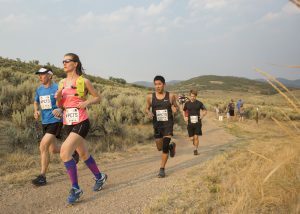 "We’re getting contributions from everyone," head coach Aaron Dufford said afterwards. "It’s not just about scoring goals; it’s about supporting each other to achieve our goal." Miele continued his high-energy playoff play, scoring the game’s first goal with just 12 seconds left in the first period. Walker and Derek Sederman got the assists off the scrum in front of the Viking net. The second period stayed 1-0, although Park City hit two posts and Viewmont hit one. Then two minutes into the third period, a loose puck in front of the Miner goal somehow found its way into the net after it deflected off of two skates. It was the only shot on the night to get by Kincaid, who saved 30 of the 31 Viking shots. "We had a big contribution from Kincaid," Dufford commented. "His stepping in for O’Connell was big." With the score knotted 1-1, it was Radovan who finished off the Vikings this night. Junior wing Derek Sederman threw a tight little saucer pass into the center ice area setting Radovan off on a breakaway. His wrist shot beat Viking goalie Landon Ramirez gloveside with 7:36 left in the game. "When it comes to converting under pressure, Will Radovan has really stepped it up," Dufford said. Park City then did a nice job of keeping pressure on the Viking defense and keeping the puck in the Viewmont zone. There were chances, but it ended 2-1, knocking Viewmont into the losers’ bracket. And now it’s down to one game, winner takes all, for the state championship. Guess we’ll need that "if necessary" game, after all. "It comes down to one game, one opportunity. It’s the team that wants it, the team that needs it will prevail," Dufford said. "We have the personnel, the team, and the common goal to achieve it!" So, you have a date Friday night at 7 p.m. at the Salt Lake Sports Complex. Be there and help the Miners bring home the school’s first affiliated state hockey title! Until then, check the team on its Facebook page, Park City Miners High School Hockey.